Tony Cummings tells the story of DAVE HOLLISTER, once a mainstream R&B star now a gospel singer and preacher. It's a showbiz truism that you can take the singer out of church but you can't take the church out of the singer. And indeed quite a number of singers who have been plucked from local church obscurity by the big promises and big chequebooks of the R&B industry have, in the due course of time, returned to gospel music and the Church. A recent example of this movement is Dave Hollister, whose second all-gospel project 'Witness Protection' soared into Billboard's Top Gospel Albums chart at number two. Those who follow mainstream R&B will know that Dave enjoyed the big time first with Teddy Riley's group BLACKstreet then as a solo with his albums 'Ghetto Hymns' and 'Chicago 85.The Movie', both going gold. But it was his move back to gospel in 2006 after a dramatic spiritual experience which has brought back to church ministry one of its most soulful, contemporary voices. His tenor voice on 'Witness Protection' is still as smooth and subtle as ever and whether it's a ballad like "I'm Here" where Dave offers himself to be moulded as the Lord sees fit or the powerfully funky "More Of You" where he rejects the carnal pleasures of old ("The house, the deal, the mills, the Jezebels and the cheap grills./I'm a vessel and I need to be filled"), the lyrics ring true. Also ringing true is Hollister's wholehearted embracing of the Church despite its faults. On "Church" the one time R&B star admits that he would once approach church while "trying to figure out what's more important, my clothes or my soul" but how today he's determined to get his praise on no matter "how the preacher spends his money" or "if the choir director is friendly." 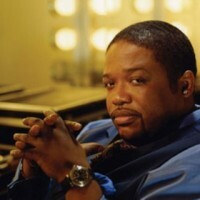 Dave Hollister was born in Chicago, Illinois on 17th August 1970. His father was a minister and Dave grew up steeped in gospel music and the teaching of the Bible. Hollister is in fact the cousin of hitmaking R&B acts K-Ci and JoJo Haley, Calvin Richardson and Fantasia. So it was hardly surprising that the young Hollister turned to the urban music industry to make a living. An early break was his appearance on hip-hop giant 2Pac's hit "Brenda's Got A Baby" and the original version of "Don't You Trust Me". His next big move was when he was signed to Teddy Riley's R&B group BLACKstreet in 1994. He worked with the group on their first album and then left the group to pursue his own solo career. He was signed to DreamWorks Records and began working on an album. In 1999, Hollister released 'Ghetto Hymns' which spawned the hit single "My Favorite Girl". Hollister's follow-up album, 'Chicago '85...The Movie' was released in 2000 with "One Woman Man" reaching number eight on the R&B charts. Also in 2000, the singer collaborated on "He Say, She Say" with Keith Sweat and T-Boz of TLC (written and produced by Andrew Lane). For his third album, Hollister moved to Motown Records with 'Things In the Game Done Changed' being released in 2002. Hollister returned to DreamWorks Records where he released 'Real Talk' in 2003. But behind the scenes things were far from well for the R&B star. His marriage was in trouble, he was battling against a dependence on alcohol and he was using copious amounts of cocaine. Things came to a head when he was driving down Topanga Canyon in Los Angeles on his way to a gig at the Malibu Inn. Hollister told journalist Mona Austin, "I was very drunk and I had consumed a half of an eighth ounce of cocaine! So I was a little discombobulated. And I was trying to operate a GMC Envoy at the time. And the [steering] wheel kind of got away from me on one of the sharper turns. From what I remember the car did three 360 [degree] spins and at the end of the third spin it flipped over three times. And then at the end of that third time, I believe it was the third time, it landed on all fours and slammed into the railing on the other side of the canyon which made the car tilt over and I was leaning over. The only thing that was holding it up was basically God and the railing that was there. If I would have made one little move that thing would have tipped over and went over. All the time the car was spinning and flipping, all I heard was 'I AM GOD, I AM GOD, I AM GOD.' The only thing that happened to me physically was that I hit my nose on the steering wheel and my nose bled onto my t-shirt. The car was actually laying on the driver's side so I had to crawl up and out of the passenger side to get out of the car." Dazed, confused and covered in blood Hollister began to walk. "When I got almost to the end of the canyon there were cars and people stopping. They were stopping and asking me was I okay, was I okay? And I was like, 'Yeah, I'm okay, I'm okay, I'm okay.' The reason I kept walking was because I had already had two DUIs. I was on probation for two DUIs and I also had a drug charge that I was on probation for. So, if I got caught anymore then I would have gone to jail for five or six years at least. But the police never found me. I just kept walking. Then I heard an ambulance or a fire truck or something like that and out of nowhere this black guy came along. He came out of nowhere with a car and asked me if I needed help, did I need a ride somewhere? He was a young black guy with braids. I don't remember his name. I don't even remember too much of what he looked like, but he asked me did I want to go somewhere. I said, 'Yeah, I'm on my way to Malibu Inn.' He said, 'Well come on because I know you don't want to get caught out here with this car and you smell like you've been drinking and such.' I said, 'Yeah.' So he took me to Malibu Inn. "Once I got to the Malibu Inn, he came in with me. I had on a sweatsuit and the blood was on the t-shirt so I just zipped the jacket up so that they couldn't see the blood on my shirt. My normal ritual every week would be to come in, the manager of the band would be standing by the door waiting for me with a Smith and Hennessy. You know, like a triple shot of Hennessy. He would hand it to me and I would take it and walk toward the stage. And once I stepped on the stage they would start my intro music up and then we would go into my performance of the evening. It was basically an open mic night and I was the host. We used to call it church and I was the bishop. I had the same intensity and the same fire as somebody in church. My shows were like church services and it wasn't the fact that I would say church things; it was just how it would come across. You know, the delivery and everything. I'm a son of two pastors so I guess it was just on me. But this night I walked past the Smith and Hennessy and just walked straight up to the stage, went to the middle of the stage where the mic was and looked at the people. They were all excited because, though I was late, I was finally there." Normally the R&B star would open his set with the Marvin Gaye oldie "Inner City Blues". But something had happened to the singer. To the amazement of his backing musicians, who were from Chicago and had grown up in church, Dave launched into a gospel hymn. Said the singer, "I just stood in the middle of the stage and started singing 'I Need Thee, O I Need Thee'. I didn't say anything about the accident at first because there were some cops that came in looking around and I just kept singing the song until I saw them leaving." The Malibu Inn was packed and in the crowd were numerous celebrities including actors Alec Baldwin and Gwyneth Paltrow and members of the Dodgers baseball and the Lakers basketball teams. It's doubtful if what happened next will be forgotten by the audience. Continued Dave, "After the cops left I began to tell the people what happened to me that night and then I opened my jacket and they saw the blood. You could hear the whole audience go 'Ohhh' and some people started crying. Then I went back into the song 'I Need Thee, O I Need Thee' and people's hands just went straight up in the air. Alec Baldwin was crying in the front with his hands up. People had drinks in their hands but their hands were up and after I finished it was emotionally powerful. The Holy Spirit came in. I finished that song and I just told them, 'It's over for me y'all, it's over.' And I walked off that stage and asked the manager of the band to take me home. I didn't live but about 10 minutes away from there. And he said that when he got back to the club, people were still in there crying and there was basically churchin'. The manager told the singer one other extraordinary thing. Remembered Dave, "I couldn't find the guy with the braids, the guy who'd rescued me and brought me to the Malibu Inn. So I asked the manager did he see the guy that came in with me, did he see him leave. He said, 'Ain't nobody come in with you.' I said 'Huh?' Nobody saw the guy. That's why I sometimes refer to him as an angel." The car accident and what happened afterwards were a turning point for the singer. Leaving the mainstream R&B world, the singer signed with GospoCentric Records and began planning his gospel debut, 'The Book Of David Vol 1: The Transition'. One of the standouts on the set was the stomper "Help Me" produced by Warren Campbell and Eric Dawkins. On its release in 2006 Dave spoke to Gospel Flava website. "God has called me to be real. Even in R&B I was always real and you could always tell where I was in my life from my music. I just felt like I had to be the same way in gospel. Who said that Christians don't have struggles? I wanted to talk about what most Christians won't talk about and what they sometimes hide from. When you get saved, everything is not easy and you still have some issues. One of my struggles is drinking and that was a BIG struggle for me. It was a question like I stated in the song: 'What's wrong with going to clubs on the weekend? What if I want to sleep in on a church day? If I drink once a week? Is that the way it is or is it just me?' I know a lot of preachers, pastors and bishops that drink. Some of them drink wine and some drink vodka. It's like, what's the problem? I am saying, 'Lord, help me. I'm just trying to understand.'" Today, Dave is an established gospel star and also a powerful preacher. The big change in Dave Hollister has been having an effect on his friends and associates in the mainstream showbiz world. "There are a lot of artists and peers of mine that are affected by my transition. I don't know if I can mention any names, but there are many that have seen the transition and seen the change in me. When I hit the stage and the anointing of God flows, then it's like, 'Wow, this dude is for real.' One well known comedian and I were both at a show - he is still in the secular arena but he was hosting this gospel show where the Holy Spirit was moving and the atmosphere was filled with worship. I looked over at him and I saw him with his hands up and crying. When he came back to the stage he was like, 'Wow. Amazing. Dave Hollister.' He wanted to just stay in the attitude of worship." I love Dave Hollister. So glad God gave him a second chance to turn his life in the right direction. Love you and your music. Dave stated his dad said get that baby out of this house. Did he forgive his dad, did his dad apologize, Is his dad still living. How his their relationship? Listening is a quality, So happy that he share this testimony because God spared him and situations like this define true power of authority vs. mankind power of authority. ALL OF THE PRAISES GO UNTO THE ONLY GOD FOR THE MARVELOUS THINGS HE HAS DONE. I KNOW YOU KNOW BY NOW THAT YOU ARE BLESSED AND HIGHLY FAVORED IN THE LORD AND SAVIOR JESUS CHRIST THE HOLY UNBLEMISHED LAMB OF GOD. HE IS ALL KNOWING AND AN ON TIME GOD HE STEPPED IN JUST WHEN YOU NEEDED HIM THE MOST FOR HE IS GOD ALL BY HIMSELF. IT COULDVE BEEN A DIFFERENT STORY........BUT GOD SAID NO THATS MY CHILD........HALLEUJAH. AND I NEVER FOUND OUT WHO DID THIS TO ME. GOD IS AWESOME BECAUSE IM STILL HERE HOLDING ON TO GODS UNCHANGING HANDS. I cried and praised God for this soul coming back home to Christ. Dave Hollister's music always came from his heart. My favorite is "I'm Not Complete". The irony of that song title is that he found out just how incomplete he was...Now he is "Grateful" and so am I! Hallelujah, may the good Lord Keep you ALWAYS! What a Mighty God we serve, and what a Powerful testimony!! !